I now know where angels get their wings from. 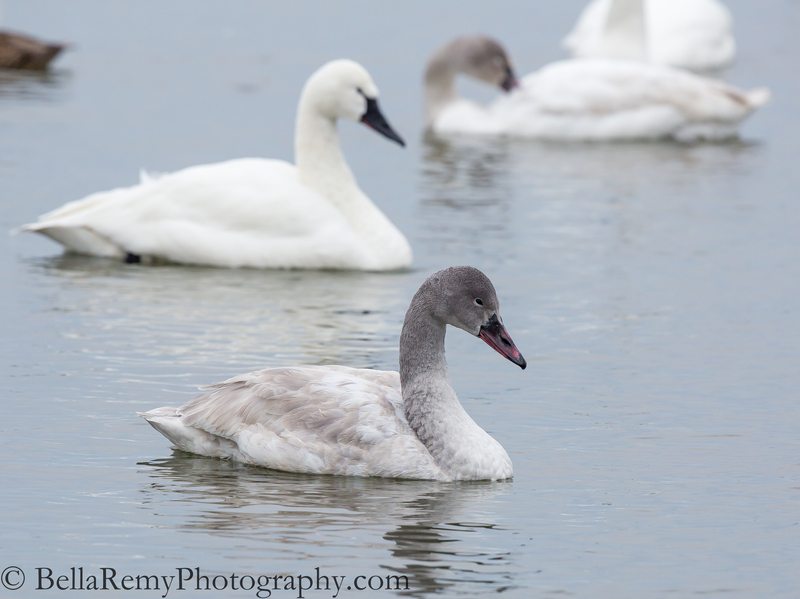 They get them from beautiful and elegant Tundra Swans. With a wingspan over five feet wide, these swans can throw their hefty 20+ pounds into a hit. Can you imagine being hit by a twenty three pound bird with five and a half feet wide wing span. You know that would hurt. But they seem so gentle and serene when floating on the water. True to the well beloved story by E.B. White, The Trumpet of the Swan, they spend their youth gray. These majestic birds winter on the Chesapeake Bay and travel over 3,000 miles round trip between the Arctic region of North America to their winter home.They are known to mate to life, showing great loyalty. When I spend time with the swans, they bring a sense of serenity to my spirit. But the swans like to squabble, much like Canada geese do. Please enjoy this short video of them in action.They really are noisy little buggers. So where are the ducks? You may ask. Well, those pesky ducks have been rather elusive and not being very cooperative models. It’s not that I don’t have some images, but not what I would call a gallery shot. But no worries, I’m not giving up yet to continue the Duck Dynasty program of the Chesapeake Bay wintering ducks. I’ll be out again tomorrow, so who knows what I’ll find. Your post is beautiful but as far as swan’s being gentle………………….if left alone they are. 80 years ago when I was in college a couple of drunk college students thought it would be fun to sneak up on 2 swans on an island in a middle of a small pond they learned 2 things 1) It is impossible to sneak up on swans especially when you are drunk and 2) It is never a good idea to annoy swans. You might be on to something! At least they don’t poop as much geese do! No joke ! I always have goose poop issues on my property. Watch where you step! I worked at a Junior High across the sound from Seattle. We had a flock of geese that lived on or near the 30 yard line of our football field. Our coach had his defense always push the opponent to where the geese pooped. The other team rarely got past the geese poop without slipping, fumbling or being intercepted. We went undefeated the 2 years that i taught there. LOVELY! And I love hearing them chatting to each other. Someday I MUST learn how to do videos! So beautiful, Emily, thank you! They are so noisy! So actually I feel for the people that take care of them in the winter. I bet they make a racket throughout the night. Imagine trying to sleep through that. I’ve got to get better about filming. I’m using the windows movie maker and it does all that fancy stuff automatically. The music I download (free) and add it easily. Much easier than other software movie maker programs I’ve tried to use. Reflecting on my distant past, I wish my ornithology professor had been able to use your visuals (and anecdotes) in the classroom! 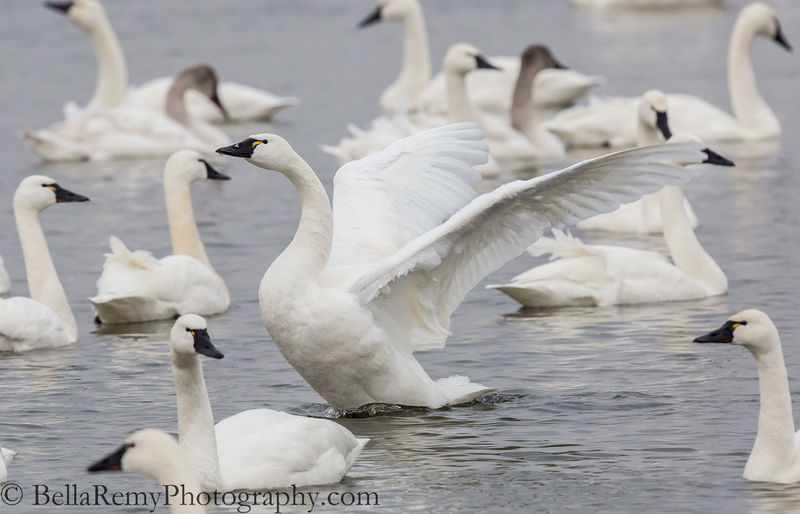 I’ve never laid eyes on a Tundra Swan so this was educational as well as entertaining. The squabble clip was super. BTW, I’ve experienced a head-on collision with a nasty old swan and it ain’t fun. Great job – your efforts are appreciated! Oh my goodness! And you survived the encounter? No dents in the head. That is certainly something I wouldn’t want to see. You are so very kind with what you said Nick. So you actually had an ornithology professor? I’d imagine that most of what he shared was rather dry. Where/when did you have that class? Yes, and you’re right – the prof was very knowledgeable … but dry. In his defense, that was the chalk and talk era in academia (you might have read about it in an ancient history class). Roughly 1970, PSU, and one of the courses that convinced me to go to grad school for an MS in wildlife science/management. Thanks, and keep up the good work! Bravo for this YouTube. The Swans are singing with Vivaldi. Thanks Perpetua ! I was lucky to find a good classical song to go along with their honking. So thrilled you enjoyed it. Great post! Swans never seem to stop being a wonder no matter how much we see them. I’ll believe angels and swans share the same type of wings! 😉 Funny though I don’t know about Tundra Swans but the Swans I always saw as a kid were quite moody, sassy buggers really. I think being “hit” by one of them would be a seriously rude awakening, disturbing really. The young ones seem so much more composed than the adults, lol, even though they look like they’ve been rolling around in soot! I didn’t get a chance to play it for them today, went to an Orchid show. 😀 😀 Then honestly when I had them out for a bit when I got back I had forgotten, thanks for reminding me. I’m smiling just imagining. Ah yes it was wonderful, though taking pictures of flowers is not always so easy. Getting shots that are an accurate representation of the colors is challenging! For the flowers, indeed it’s a challenge. Bet you’re talking about the yellows, reds and oranges right? They are always tough and require tweaking in the camera, and also in post to get the colors right. Reds yes, the others were deep vibrant pinks and purples, but especially the bright pinks and reds I’d say. Only trouble is remembering exactly the shade it was when you get to editing it later! I worked in manual the whole time as I’m trying to learn more. Hopefully one day I’ll be able to adjust appropriately and more quickly. So I did a lot of adjusting but some were just a beast to get. Oranges were maybe next on the list though yellows didn’t give me too much trouble really. It may be a white balance issue. Were you using Auto White balance or did you select something else. I don’t bother with manual, but use Aperture priority. I can then use the negative exposure option to offset the ‘heat’ of those colors. That’s a great question! I did change the white balance at some point from auto to daylight then back again. It was indoors but there was a lot of light coming in and the ceilings were really high so I thought daylight was appropriate…? But then I went back to auto. I’ve heard many others talking about aperture priority as opposed to manual, I’ll have to look into this and learn some more about it. Practice!!! Remind me again if you use Canon or Nikon? Aperture Priority is the lazy mans way of shooting. You set the f/stop and the camera figures out the shutter speed. Which means you have to keep an eye on the SS so that it’s fast enough to avoid camera shake. that is, unless the camera is on a tripod. I like it as I don’t have to change as many things as I usually do. But saying that, I’m always changing my ISO at least. Not as often the f/stop. You were dealing with mixed lighting, artificial and natural. Which is a nightmare with white balance. Do Auto, shoot RAW and adjust it as needed in Lightroom first before adjusting any other things. In LR, you can adjust saturation and ‘luminance’ which really helps with the tones of the colors we’re talking about. I have a Canon Eos Rebel T2i. At the show I used my 100mm macro lens. I had to open the aperture as big as possible some of the time and slow the SS to get the shots I wanted but then most of the time I had to use my flash when I would have preferred not to. I thought about bringing my tripod but chose not to. Turns out I couldn’t take a clear picture without using my flash. I’m not yet familiar with LR, I’ve been using Photoshop and adjusting in Camera Raw. However I do intend to learn about LR and have imported pics into it. When I get some pics together I’ll share and let me know what you think…but that might be tricky without knowing what the real flower looks like! Like I said some of the them turned out pretty good. Couple more weeks and I’ll get to practice at another show! Now that is a truly interesting story. Can you imagine, burying your babe in a swan’s wing. WOW ! They are so loud, but the honking is so much fun to hear. But I hope they sleep at night. That would be terrible wake up call. Nice photography! Do you ever take pictures of Monkeys? Hi Beth, no monkeys where I am except at the zoo. Most of the ones at the zoo either have glass or caging in front of them, making it challenging. There is beauty and fury in Nature in equal measure. I once saw a swan jump onto a rowing boat and flap its wings and screech to frighten couple away who had steered their vessel too close to the swan’s nest. It was really scary. Glad I wasn’t on that boat! Nature in action indeed! Great video! OMG ! That is the funniest scary story I’ve ever heard. Yep..not ever going near a swans nest ever. Thanks for the warning! I won’t forget that experience for as long as I live, and never will that couple, I bet! Sorry, I just noticed in you final credits that you have the music score as Bach, but it’s in fact Vivaldi’s Spring from the 4 Seasons. Isn’t that the truth! They are one rowdy bunch.